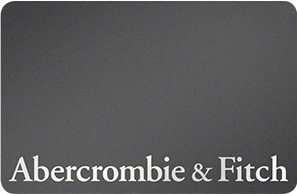 The go-to place for upscale casual wear for men and women ages 18-25, a discounted Abercrombie & Fitch gift card will get you more of the great trendy clothes you love, for less money! Established in 1892, they have continued to be an American standard for the young. In fact, as of 2016, there were 278 locations across the United States, with additional continued growth internationally. Their clothes are modern, casual and top-notch! Purchase an Abercrombie & Fitch gift card today and let the savings begin! What’s more, because gift cards are a form of currency, all other sales, promotions and coupons remain valid- this means, even more, money saved on the upscale casual clothes you love! Stop in today to discover for yourself why some young people only shop here and nowhere else. Perhaps you know someone who loves to shop here but who is limited by their budget. Good news is, gift cards make excellent presents! What could make them happier than an Abercrombie & Fitch gift card? And just think, you’ll pay less for it than if you bought it anywhere else- a win-win situation all the way around! A discounted Abercrombie & Fitch gift card from Cards2Cash will save you money, but the savings don’t stop there! Cards2Cash offers discounted gift cards for American Eagle Outfitter, Forever 21, Express, and more! Make sure to check out all our listings for savings on everything from restaurants to hardware stores! With Cards2Cash on your side, saving money while looking great is easier than it has ever been before! Do you have an Abercrombie & Fitch gift card you aren’t going to use? Cards2Cash will turn your card into cash. We pay the highest possible price for unwanted gift cards for many national websites and stores. From restaurants to pet shops! If interested, stop in one of our retail locations for fast payment for your unwanted card OR fill out our online form and we’ll get back to you with an offer you won’t refuse! Cards2Cash is your one-stop gift card shop!